A couple of months ago I moved in to a new house that actually had a backyard! I had lived in an apartment for so long I totally forgot what that was like. Being able to stand outside and breathe some fresh air instead of being stuck inside. It was great at first, but then I remembered that backyards needed to be mowed and trees groomed. I am not a big fan of letting strange people into my house so I figured that I could totally do some gardening myself. I went out and bought a lawn mower, leaf blower and chainsaw and set out the next day to get the work done. I can’t complain the tools got the job done. But the next day I was all tired and beat down for getting into awkward positions and sometimes on my knees to get some tough spots in the yard. Still I stuck with these tools for a while until I realized how much money I was actually spending every time that I set out to work on my garden it was ridiculous. If you just guessed it yes all of my tools were gasoline powered. That meant that every-time time that I wanted to use them I had to buy some gas. It may not seem like much, but adding it up money wise it may even be cheaper in some areas to find someone to landscaping work for you. Plus whenever I use gas powered tools it starts smelling really bad and the stench stays in your clothes for a long time. Just a little gardening time and you end up like a mechanic. I got out of the apartment to have a chance to breathe cleaner air that wasn’t happening. I was about to hire someone else to do my landscaping for me when I found the Earthwise CVPS41008 online. At first I was skeptical I had never been a big believer in pole saws, let alone electric one’s. I immediately thought it would lack the power to perform like a gas powered chainsaw. Especially while being attached to the pole. But doing a little research I found that It had decent reviews and it was on sale at a really affordable price. I am not a huge go green guy, but definitely not a fan of smelly gasoline. So I took a chance hoping it wouldn’t blow up in my face. Then again the 6 inch pole saw version was on sale at 66.50 while most other pole-saws go from 100 to 200$. The first thing I noticed by reading the reviews and corroborated it when it arrived was that the chain is not oiled when it comes in. So if you buy don’t just try to charge it up and go. You need to make sure that the chain is well oiled before use. Not a great start for a green product, but then again there are other forms of lubricant you can try to use if going completely green is your main concern. They do warn you about that issue though you can’t exactly blame them for that one. When I actually started using it I felt totally surprised. First off it’s and easy plug-in charge motor. So no more trips to the gas station or anything like that. Your electricity bill won’t suffer either. Then definitely contrary to what I initially thought it totally has the power to stand up to the best of them. 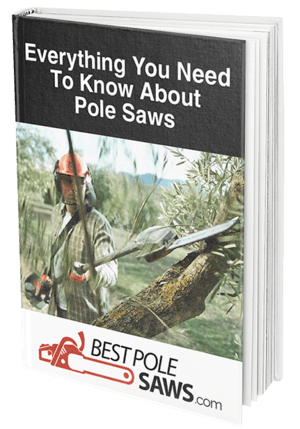 Even being used as a pole-saw it can cut up to 6 inch thick trees with no problem. My favorite feature by far is the adjustable head! You can virtually use it cut from any angle. Which for me meant not having to break a full sweat to be able to cut in difficult spots. That was huge for me! Because it not only can cut up to ten feet in the air. You can actually use the pole to cut things that are also too low to get. So no more getting on my knees or having to look for a way to stand up. It was almost like setting up a golf shot in a bad lie. Another hassel you can avoid is having to tire yourself out from pulling the cord to start it up. If you ever used any tool that runs on fuel you know that if you don’t use it in a week or so and try to start it up. You’ll probably have to pull on the cord pretty hard more than once. With the Earthwise CVPS41008 it always an automatic start! Both the 10 and the 8 inch versions come with a 7 Amp 120/60Hz Motor. While still being light enough to easily maneuver. Plus you loose all the weight that gas adds up so that’s also a big plus. Especially for those of us that don’t frequent the gym. For me it's the total package for that price. I know it may not look like the perfect tool for heavy duty jobs. But it is essentially built more for suburban use. Let’s be honest it's not like most of are using these tools to cut down 100 foot trees! It’s adjustable head makes it perfect for hard to reach places. Essentially it bends so that you don’t have to. But if you are still the kind of guy who needs to get his hands dirty no problem. Use it as a hand held saw with the same results! This product holds a very good rating on Amazon.com. All users who wish to buy this product can purchase it for about $90 from Amazon with free shipping. Most people have described their positive experiences in detail to emphasize how much valuable this product is. If you are still not convinced to give the Earthwise CVPS41008 a chance just think of how much you will be spending on gas for the next month using your old tools. That was what really convinced me to at least give it a shot. Not only the money, but we are all into landscaping to make natural beauty even better. So is it not very hypocritical to do so using tools that harm the environment? If you’re curious check out all the questions and reviews on the product on Amazon.